This is a follow up post to the initial PSP port I presented in the engine release thread. Now that the port has matured a bit and can be considered almost complete and more user-friendly here is a proper release thread for it. 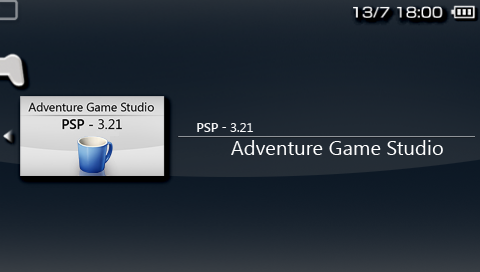 Still, this is a port of the 3.21.1115 runtime engine to the PlayStation Portable. To play it you need a PSP 2000/3000 or Go with a Custom Firmware or Homebrew Enabler. The engine will start on a PSP 1000 but due to the lower total available memory, you cannot run most AGS games. Games can just be copied as they are into the ports folder on the PSP, no more renaming to "ac2game.dat" as in the initial version. Now the game data is autodetected. If the game data is compiled with an incompatible AGS version, the launcher will tell you so. There are various options that can be configured in a text file. See the Readme for details please. I will put an updated version there whenever I make changes to the source. Please also post feature requests and bugs there. Would it be possible to build a version of this that compiles everything as an eboot? What I mean is, can a version that loads a single game automatically, bypassing the need to load a game from a seperate GUI, be implemented? Some PSP emulators use a cache file system to avoid the PSP1000's memory limitations. Could something similar be used here? I was actually just looking into it, and the Android NDK might actually make an AndroidGS engine port more feasible. I'm not nearly versed enough in C++ to attempt it myself, and a fair amount of the engine would probably still have to be ported directly to Java. Probably not impossible though. if I were you, I'd get working to it, before I GET MY HANDS ON YOU. Now, work!! Its doable. Allegro is being ported to Android (In the developers spare time of course) and Android does have an SDK for C++ programmers. I think this should be next on the portability front as, I er hem, own an Android. But also, Android seems to be available for more phone companies than the iphone/pad is. If you put the data files in the same directory as the eboot and rename the games executable to "ac2game.dat", the launcher will directly start that game. I don't know about that. The PSP lacks an MMU and therefore "virtual memory" cannot be implemented in an efficient way. The difference between a 1000 and the other models is having about 17 MB and 48 MB heap respectively. Unless really digging into the source code and changing the way it uses memory I don't think anything can be done for the 1000. Even the other models run out of memory with large rooms, e.g. Eternally Us crashes in the first room because it is gigantic and Of The Essence runs out of memory for the pathfinder. Yea, eternally us is graphically huge and loads a lot of full screen pngs into memory. This was before i discovered doing alpha blended particles dynamically. Even the other models run out of memory with large rooms, e.g. Eternally Us crashes in the first room because it is gigantic and Of The Essence runs out of memory for the pathfinder. Ah, I see. I was specifically referring to something like MVPSP (a NEO-GEO emulator), which must generate separate cached data files on the 1000, to enable larger ROMs to run, while the same ROMs run on the 2000 and up without the need to do this; the extra memory of these models allowing the full ROM to be loaded directly. I thought something similar might be applicable to this project. Of course, this was based on my knowing exactly nothing on how these things actually work. Good to know about the eboot possibilities, though. Made a small update after a bug report from here. The King's Quest I and Quest for Glory II remakes now run without crashing. There were still parts with misaligned pointers in the scripting engine and I had forgotten to update apeg when I switched from libvorbis to libtremor. The update is available through the same URL as before. Btw. LimpingFish, I tried Dead Hand on my Go and it runs there. Unfortunately the 3d is too much for the PSP so that it only displays at 1 fps. Sorry but how do I set it up? I got the app on my psp(5.50 gen d full) however I dont know were I should place games and if I have it set up right on my memory card. I can see the app on psp btw. You just copy the whole folder that contains your AGS game into the folder with the EBOOT.PBP file. For example you got the port in "x:\PSP\GAME\ags\", then you copy the data files of a game into "x:\PSP\GAME\ags\my ags game\". That folder then contains the game exe, audio.vox, speex.vox, etc. Every game you want to add gets its own folder. Unfortunately I spoke too soon for QFG II, that game seems to randomly crash from lack of memory later on (the fix was for making it start at all). Thanx a bunch. I was def not thinking about putting anything in that folder. Alright, let's make sure that we got a compatible game and that the folders are set up correctly. When I run the port with this setup, everything works as expected for me. The error you are receiving sounds like the files are still in the wrong place, so can you please check that? I dont see some of those files. And the Eboot is inside bin however the way you have it shown is that it is in the AGS folder. If I use the AGS folder then the icon is damaged however when I use the bin folder out side of the AGS folder with the ebout/psp.cfg inside it it shows but I get that error even though the game is in that folder with eboot. "bin" folder? Are you using the old version that I initially posted in the engine thread? Please download the current one from the URL given in the opening post. So there was an update after all, I thought it was. Thank again for helping me through this.